Yesterday, I’ve posted about the Opera Next (Opera 15) which is the first version of the Opera after integrating with Chromium. This new version 15 has so many cuts and shaves. You will certainly feel the direct chromium look and design. The New Opera 15 uses the Google’s Chromium Browser engine. That enables the Opera to render the webpages faster than before. Also, You can install the flood of Chrome extensions in Opera from Chrome Web Store. In addition, You can also install extensions offered by Opera. At this point, Opera 15 (available as Opera Next) supports a subset of the Chromium extension APIs — with more to come. According to this statement, Currently you can install Chrome Extensions in Opera but all not going work. You can expect more functionality when stable version released. 1. Go to Chrome web store to install any chrome extensions in opera. 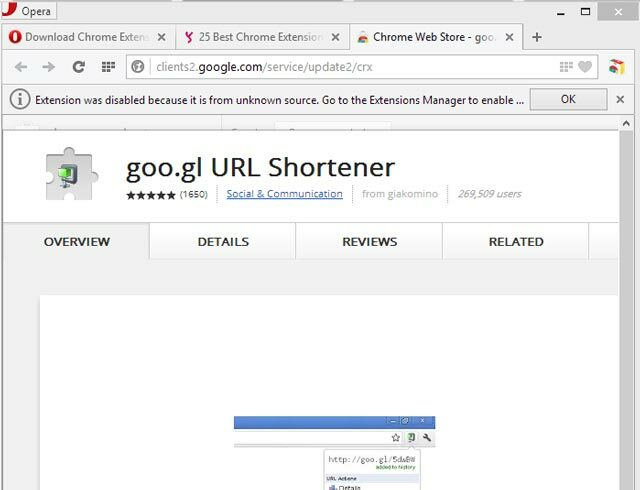 (or Visit our 25 best Chrome Extensions and apps page ) For example, I’ve opened the Google URL Shortener extension page. But in Opera there is no Add to Chrome (ie: Download) button. 2. To install the extension you need download button. To fix this issue, you have to install “Download Chrome Extension” from Opera add-ons page. When you install that Add-on, Opera will notify you that ” Extension was disabled because it is from the unknown source. Go to extensions manager to enable it”. So Go to extension manager (Press CTRL + SHIFT + E), and click install button. Now you can see the Chrome store icon beside the address bar of Opera. 3. Now Visit the Chrome extensions page and click the Chrome Store Icon in the Opera to install any extension. 4. 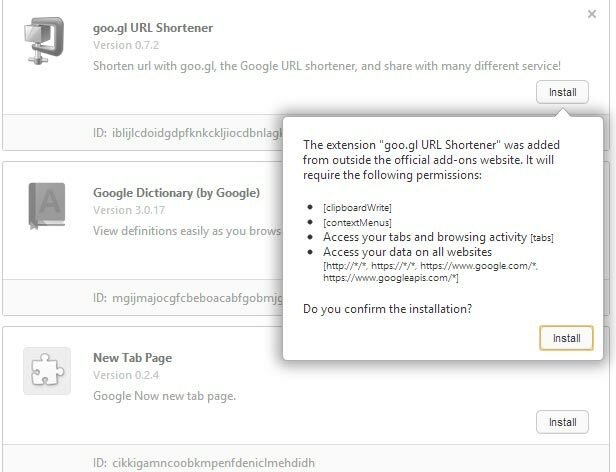 Also note that same notification will arise for all extension installation, go to the extension manager to enable installed extensions from Chrome Web Store.. Note that You can’t download many Of the Extensions. Here is the list of working Chrome Extensions to install in opera.